You will be a member of one of our research teams, and your work will be an important contribution to the group’s discoveries. Summer research lab experience is an invaluable opportunity to gain hands-on experience in a research group and to get career advice from fellow students and mentors. They are also a great way to meet new people; we are a small, friendly department, located in the heart of London. Working hours will be 35 hours per week for between 6-8 weeks. You can expect to receive a stipend of between £180 and 200 per week during your stay if the application for funding is successful. There are also opportunities for unpaid research lab experience. Structural mass spectrometry comprises a suite of techniques which can provide insight into tertiary protein structure and protein interaction networks. The Thalassinos lab employs several of these tools, including native mass spectrometry and ion mobility, in order to answer fundamental questions in structural biology. One technique of recent interest is crosslinking mass spectrometry (XLMS), which can be used to gain low resolution structural insights into protein species which prove challenging to study by classical high resolution techniques. XLMS proceeds by addition of a chemical crosslinking reagent to a protein or complex, which reacts to connect two functional groups contained within amino acid side chains. Crosslinking reactions can be carried out in vitro or in vivo under physiological conditions, providing information on native conformations, including those of transient protein assemblies and disordered species. Crosslinked species are then subjected to enzymatic digestion and mass spectrometry, enabling identification of modified amino acid residues. Since modification sites are dependent upon both solvent accessibility and length of the crosslinker spacer, their identification serves as a basis for structural determination. During this placement opportunity the student will participate in ongoing work in the Thalassinos lab to develop an XLMS platform using a QToF based mass spectrometer, including evaluation of chemical reagents for carrying out crosslinking in vivo. The project will address the molecular role of defective plasma proteins in causing disease. As an example of such a project, age-related macular degeneration (AMD) is the main cause of blindness in the Western World in people over 55 years. Deposition of proteins, ions and lipids as “drusen” between the blood circulation and the retina is a major risk factor in AMD. Drusen usually grow in size and spread with age, disrupting the normal function of the retina, but may disappear. We are presently unravelling the many interactions of complement factor H with its ligands and how these may be a crucial factor in causing AMD. In order to clarify the involvement of intact complement factor H with its ligands, the summer project will involve the purification of the homozygous high-risk and low-risk forms of factor H from patient plasma, or their recombinant fragments, then interaction measurements of the two forms with ligands will be made using surface plasmon resonance and/or analytical ultracentrifugation. Alternatively, to follow our mutations web-site (http://www.complement-db.org/home.php), disease-risk mutations in recombinant Factor H fragments will be created by mutagenesis and studied using the same methods to show whether these are causative of disease. One paid summer research placement is available for 8 weeks. The deadline for applications is Monday 14 January 2019. We have an ongoing collaboration to develop a databank for biologically relevant infrared (IR) spectra, together with other standard IR spectra useful for data processing and experimental design. Standards are agreed and the bulk of programming is done. During this studentship, you will take part in the critical steps of uploading the first spectra and testing the prototype. In our labs, a large amount of quality spectra exist, and we want to make them publicly accessible for use by the wider research community, enabling high standards in this field with developing applications from structural biology to medical diagnostics. To populate the databank will be a critical step in making this a useful resource, and the upload process, i.e. submission, as well as basic validation checks and possibly searching of the databank all need testing. The student will be doing so in close collaboration with the team, to inform all aspects of databank development. There is also the possibility to get hands-on experience in IR spectroscopy (1) and collect more reference spectra of importance to make this a comprehensively useful, public resource in the spirit of Open Science (ref). The project will be co-supervised by an IR specialist (AM), a bioinformatics specialist (MW) and coordinated by TD to provide a network with other databases, notably the Protein Circular Dichroism Data Bank (PCDDB)  and the IR user community. (1) Barth A (2007): Infrared Spectroscopy of Proteins. BBA Bioenergetics 1767, (9): 1073-1101.
α1-Antitrypsin is a plasma protein that protects the lungs from damage during an inflammatory response. Defects in this protein cause a type of disease called a serpinopathy – part of a broader class of protein conformational diseases that includes Alzheimer’s and Huntington’s – and is the subject of at least five current drug discovery programmes within the pharmaceutical industry. As a potential drug target, α1-antitrypsin presents unique challenges, because its pathogenicity is associated with a conformational change that results in formation of an ordered aggregate called a polymer. The most common pathological ‘Z’ mutation causes polymers to form insoluble deposits within liver cells, predisposing individuals to cirrhosis, as well as emphysema due to a protease-antiprotease imbalance in the lung. The student will have the opportunity work in a multi-disciplinary laboratory that is using structural, biophysical, genetic, clinical and cell-based techniques to understand the molecular mechanisms of this class of disease. Because structural change is fundamental to the physiological role as well as pathology of α1-antitrypsin, we have produced conformation-specific monoclonal antibodies to monitor its behaviour. These antibodies are being used as probes of changes that occur during polymerisation. This project will involve the use of electron paramagnetic resonance spectroscopy, FRET, custom conformation-specific monoclonal antibodies, protein expression and purification, and protein functional characterisation to undertake fundamental research in order to contribute to an important clinical aim. Anticipated outcomes: (1) Experience in recombinant protein expression, purification and characterisation; (2) use of biophysical approaches to identify the site of protein-protein interactions and identify structural consequences of defects in protein stability; (3) the use of chemical probes and antibody-based techniques to track structural changes that occur during polymerisation; and (4) an evaluation of the data against structural models to draw conclusions regarding the mechanism of polymerisation. The rise of antimicrobial resistance is leading to ever-more untreatable illness. Intracellularly surviving bacterial pathogens have endogenous machinery to evade host defence as well as antibiotic treatment. Drug efflux and formation of biofilms are the two key fundamental mechanisms of intrinsic resistance which renders many antibiotics ineffective against them. Mycobacterium tuberculosis has unique multi-drug transporter protein complexes that allow the pathogen to take up nutrients for survival while allowing it to extrude deleterious ones so as the signalling molecules for quorum-sensing leading to biofilm formation. Aim of this project is to understand the molecular mechanisms of these mechanisms to inform new drug-design as well as repurposing existing drugs (such as NSAIDs) with the aim of reversing the phenotype from tolerant to susceptible thereby developing a novel host-directed adjunct chemotherapy. This interdisciplinary research project will offer the candidate training in structural molecular biology, biochemistry and microbiology research, providing experience of drug discovery and development. Repurposing drugs for treatment of tuberculosis: a role for non-steroidal anti-inflammatory drugs. (2016) Maitra A, Bates S, Shaik M, Evangelopoulos D, Abubakar I, McHugh TD, Lipman M, Bhakta S. Br Med Bull. 118(1):138-48. doi: 10.1093/bmb/ldw019. Repurposing-a ray of hope in tackling extensively drug resistance in tuberculosis. (2015) Maitra A, Bates S, Kolvekar T, Devarajan PV, Guzman JD, Bhakta S. Int J Infect Dis. 32:50-5. doi: 10.1016/j.ijid.2014.12.031. Antitubercular specific activity of ibuprofen and the other 2-arylpropanoic acids using the HT-SPOTi whole-cell phenotypic assay. (2013) Guzman JD, Evangelopoulos D, Gupta A, Birchall K, Mwaigwisya S, Saxty B, McHugh TD, Gibbons S, Malkinson J, Bhakta S. BMJ Open. 20;3(6). pii: e002672. doi: 10.1136/bmjopen-2013-002672. 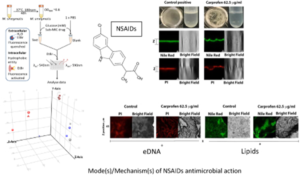 Nonsteroidal anti-inflammatory drug sensitizes Mycobacterium tuberculosis to endogenous and exogenous antimicrobials. (2012) Gold B, Pingle M, Brickner SJ, Shah N, Roberts J, Rundell M, Bracken WC, Warrier T, Somersan S, Venugopal A, Darby C, Jiang X, Warren JD, Fernandez J, Ouerfelli O, Nuermberger EL, Cunningham-Bussel A, Rath P, Chidawanyika T, Deng H, Realubit R, Glickman JF, Nathan CF. Proc Natl Acad Sci U S A. 2;109(40):16004-11. doi: 10.1073/pnas.1214188109.